Choosing where a child is educated is one of the most important decisions Canadian parents can make. Depending on geographical location, families may be able to choose a public school in either official language, a separate Catholic school, an independent school, a charter school, or decide to educate their children themselves through homeschooling—when parents decide to provide their children’s education themselves. Parents in every province are legally entitled to educate their children at home. Some provinces allow parents more discretion in their choice to home educate, solely requiring a notification to the local school board, while others require approval of education plans prior to beginning homeschool, as well as periodic reports on the student’s progress. Three provinces—British Columbia, Alberta and Saskatchewan—offer limited funding towards the direct cost of homeschooling. While the other provinces do not provide any specific funding to homeschooled students, they may allow home-educated students to enrol in specific school courses, participate in school extracurricular activities such as sports and field trips, and offer curriculum material and resources without any fees. In general, home education represents a very small share of total student enrolment. Manitoba has the highest level of homeschooling in the country, although it accounts for only 1.5 per cent of total enrolment. The other two Prairie provinces, Alberta (1.4 per cent) and Saskatchewan (1.2 per cent), have the next highest proportion of students being homeschooled. Quebec has the lowest proportion (0.1 per cent). 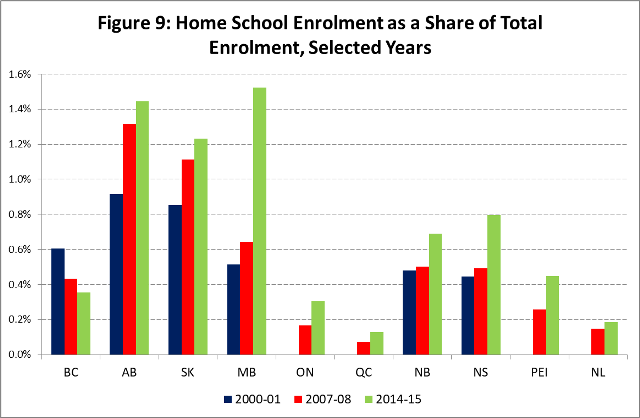 Despite overall low shares of student enrolment, homeschooling has experienced strong growth in terms of absolute enrolment over the past five years in nine out of 10 provinces (see below). As one might expect, given the decentralized nature of K-12 education in Canada, the mix of public, independent and home-based education varies by province, as does the funding and regulation of these sectors. Across Canada, the public school systems remain by far the largest providers of education. However, depending on the province, there are several opportunities for school choice within the public system. One form of choice and competition afforded to students across the country is education in a second language—English in Quebec, French in all other provinces. Alberta, Saskatchewan and Ontario also provide full funding for separate schools (primarily Roman Catholic). Finally, charter schools, which are currently only available in Alberta, are another way to inject parental choice and competition into the public education system. Nevertheless, the proportion of students enrolled in public schools has declined over time—every province has seen a decline in the proportion of students enrolled in the public system from 2000-01 to 2014-15. The general reduction in public school enrolment has been met both with increased enrolment in independent schools and with a larger share of families choosing to homeschool their kids. Generally speaking, Alberta currently offers the greatest degree of school choice in Canada. Apart from having five fully-funded public school choices, it also provides substantial funding for students wishing to attend independent schools and for parents wishing to educate their children at home. Again, charter schools offer parents additional options outside the traditional linguistic and religious options offered by public school boards. At the other end of the spectrum, the Atlantic provinces tend to offer comparatively less parental choice and competition between schools. None of the four provinces provide separate school education, nor do they offer funding for parents who choose independent schools. However, despite the different levels of funding and the wide variety of regulatory environments across the country, an increasing number of families from every province are choosing educational options outside of the public education system.